Wet sandy or mucky shores and hollows, mud flats, river banks. 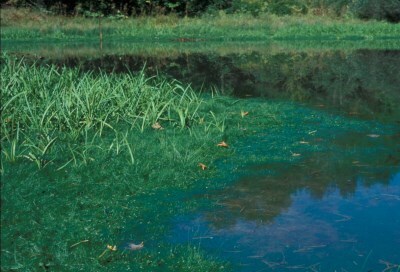 Small plants, with hair-like culms, often about 5 cm tall (sometimes 10 cm or even more if submersed—see couplets 26–28 of Key A, to aquatic plants with all leaves floating or submersed); the tufts (connected by slender rhizomes) may form dense carpets, both on wet shores and submersed. Two other common small species (though usually with slightly thicker culms) are sometimes confused with this one, at least when mature achenes are not present: E. intermedia and E. flavescens. In E. intermedia the anthers are less than 0.5 mm long; in the other two species, 0.5–1 mm. The basal scales of the spikelets in E. acicularis are fertile; in E. intermedia and E. flavescens, they are sterile. Eleocharis flavescens and to some extent E. acicularis both have the sheaths thin, whitish, and loose at the summit. Eleocharis quinqueflora when very young may be readily distinguished by its much larger anthers (ca. 1.5–2.5 mm) and rather prominent blunt often slightly swollen tips on the vegetative culms. MICHIGAN FLORA ONLINE. A. A. Reznicek, E. G. Voss, & B. S. Walters. February 2011. University of Michigan. Web. 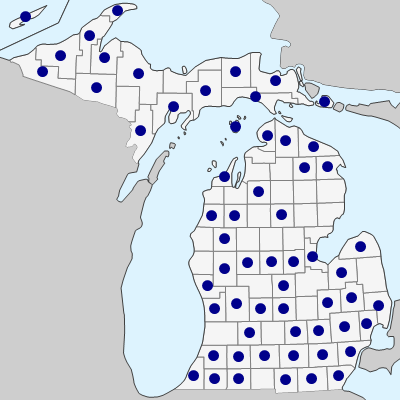 April 22, 2019. https://michiganflora.net/species.aspx?id=1100.